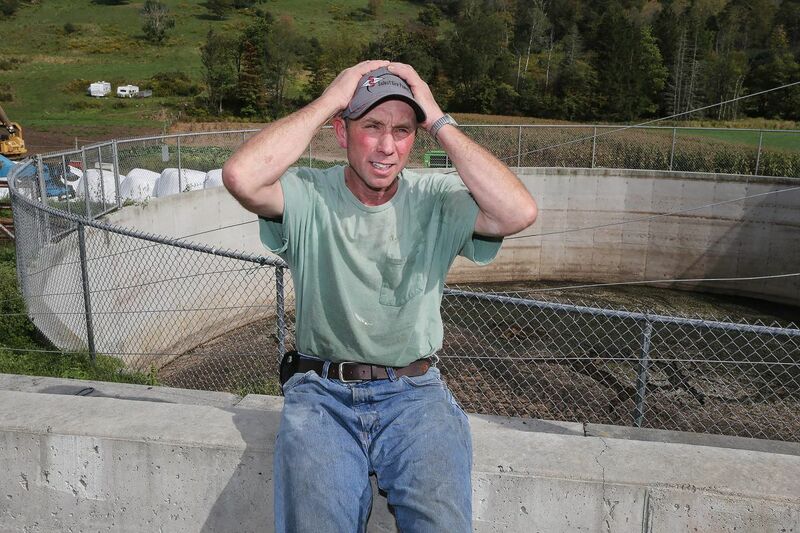 Tim Riefler says he wants to make more improvements to his Wayne County farm, such as the manure storage tank behind him, but he can’t afford them without money from shale-gas drilling. HONESDALE, Pa. — Tim Riefler is at wit's end. His dairy farm is falling apart. His credit with the feed dealer is shot. The windmill that draws water for his cows is broken. He owes $20,000 in bills. With the drug scourge, he can't find reliable hired hands at $10 an hour — one worker drove an ATV through the barn wall, creating a hole that, well, you can drive through. The outlook was much more positive for Riefler, 53, a decade ago, when shale-gas companies moved into northeastern Pennsylvania and began signing leases with thousands of Wayne County landowners to extract the natural gas beneath their lands. Many, including Riefler, received initial payments. Several test wells were drilled. He spent the money, not to indulge a dream and buy vintage muscle cars, but to invest in enhancements such as a $129,000 concrete manure storage tank to prevent cattle waste from flowing into a nearby creek. But in 2010, the Delaware River Basin Commission imposed a temporary moratorium on more exploration until it adopted comprehensive regulations governing Marcellus Shale activity. The industry was stopped in its tracks. So were Riefler's dreams. The Delaware River Basin Commission in September set the stage to permanently ban shale-gas drilling in the Delaware River watershed, which primarily applies to remote and rural Wayne County in Northeastern Pennsylvania. After years of inaction, last month the DRBC announced it would move forward to approve a permanent ban on drilling and hydraulic fracturing. Now, nobody is happy: not the landowners who favor drilling and say they've already lost hundreds of millions in income from the moratorium; not the environmental activists who fear the proposed regulations will still allow water withdrawals and wastewater disposal to support drilling elsewhere. The only thing they agree on: that the issue will end up in court. “If this proposal goes through, we will be first in line to litigate,” said Maya K. van Rossum, head of the Delaware Riverkeeper Network, which advocates a statewide drilling ban. “If they completely ban the exploration and drilling of natural gas in the Delaware River basin, that will create a lengthy legal battle where people will fight for their property rights like they’ve never fought before,” promised Brian W. Smith, a dairy farmer and chairman of the Wayne County Commission. Ray Rutledge (center) and his brother, Garry, and Garry’s son, Matthew, favor shale-gas development. Their ancestors began farming in Wayne County about 1810. “I don’t anticipate this will be settled in my lifetime,” said Ray Rutledge, 79, who works his family’s seventh-generation farm in Damascus Township with his brother and nephew. He said they spent the gas-signing bonus to pay down debt for a new barn. Their best tractor is 27 years old. DRBC spokesman Clarke Rupert asked the public not to prejudge the proposed rules, to be published by a Nov. 30 deadline, with public hearings and comment to follow. The prolonged fight over drilling has become a test of the authority of the DRBC, which manages the watershed. Its five members include governors of the states drained by the Delaware and its tributaries — Pennsylvania, New Jersey, New York, and Delaware — and a federal government representative. A drilling ban would primarily affect Wayne and Pike Counties in Pennsylvania. In 2015, New York banned horizontal drilling and hydraulic fracturing statewide, including an area surrounding some of New York City’s Catskills reservoirs in the Delaware basin. Geologists say the Marcellus Shale’s gas content peters out beneath the Delaware basin and does not seem to be commercially viable to develop at current low gas prices. Nevertheless, pro-drilling landowners say a DRBC fracking ban would foreclose future options and amounts to a government taking of their property. They fear the agency, and the anti-development sentiment driving it, will encroach on other land uses that are the foundation of northeastern Pennsylvania’s economy: agriculture; timber; bluestone quarries. Curt Coccodrilli, who is leading a legal battle against a Delaware River basin drilling ban, stands near the ridge that divides the Delaware watershed from the Susquehanna basin, where drilling can be conducted. Coccodrilli’s sentiments resonate in Wayne County, where two-thirds of the voters sided with Donald Trump in last year’s election. They see the ban as the latest attack in a cultural war in which they are outgunned by media-savvy interests from New York City and Philadelphia. Landowners say 10,000 shale-gas wells have been drilled in other parts of Pennsylvania, and wonder why a practice that can be legally conducted a few miles away in the Susquehanna watershed would be banned in the Delaware basin. “Why it can be done safely in other places and not here just doesn’t make any sense,” said Betty Sutliff, a retired elementary-school teacher active with the Northern Wayne Property Owners Association, 1,400 landowners who own more than 100,000 acres. Betty Sutliff, shown here with her husband, John, has been active forming a new pro-gas advocacy group called the Upper Delaware River Basin Citizens to fight a permanent drilling ban in their area. The NWPOA spent $750,000 on legal fees 10 years ago to negotiate a lease with drilling companies that contained protections for landowners and the environment. As a concession, the landowners agreed to receive much of their $3,000-per-acre bonus payment only when drilling began. After the DRBC declared its moratorium, the drilling companies walked away, taking $187 million off the table. Pennsylvania regulators say drilling has adversely affected nearly 290 private water wells statewide, but there are no cases of impaired public water supplies. Anti-drilling activists say visions of dollar signs have impaired landowners’ judgment. “A lot of people who want drilling aren’t really thinking clearly about it because if they went and looked at it and understood, they would be impressed by the damage,” said Barbara Arrindell, director of Damascus Citizens for Sustainability, a nonprofit advocacy group she cofounded to resist the gas industry. Shale-gas proponents say they see prosperity in neighboring Susquehanna County, one of the state’s most intensely drilled areas. One company alone, Cabot Oil & Gas, announced in June it had paid $1 billion in royalties to mineral-rights owners in Susquehanna and Wyoming Counties since drilling began. “We see people who have money to send their kids to college, can go to the doctor, can afford to put money in the church collection plate on Sunday,” said Smith, the Wayne County commissioner, who drives a school bus to make up for his money-losing dairy operation. Some anti-drilling activists believe the DRBC put the drilling ban on the agenda now because of electoral politics. But the consensus in Wayne County, among supporters and opponents of drilling, is that the action is a legal maneuver intended to address a weakness in the DRBC’s federal court battle with the Wayne Land and Minerals Group, the landowners group headed by Coccodrilli. Wayne Land owns a 180-acre hunting club on the boundary between the watersheds, and in 2016 it challenged the DRBC’s jurisdiction over gas drilling. U.S. District Judge Robert D. Mariani in March ruled the DRBC does have authority, but he criticized the agency for its “contradictory and confusing” conduct over the decade, when it appeared to be close to adopting drilling regulations several times then sidestepped the issue. A view of the Delaware River from Narrowsburg, N.Y., looking at Pennsylvania. The Delaware River Basin Commission is drafting regulations to ban gas drilling in the Delaware watershed. “The lawsuit has finally made them realize they have to deal with this,” said Arrindell, of Damascus Citizens. Activists say the DRBC can justify the ban because of the “exceptional value” of the Delaware’s headwaters, much of it a National Park Service-designated scenic and recreational river. “A lot of the landowners feel responsible for creating this great water quality, and now the great water quality is working against them,” said Smith, the county commissioner. Tim Riefler said he was counting on gas-drilling income to help keep his fourth-generation Wayne County farm afloat. Riefler is among them. Long before he heard of Marcellus Shale, he was securing grants from the U.S. Department of Agriculture’s Natural Resources Conservation Service to pay for environmental improvements to keep his 140 cattle and their waste out of the stream threading through his 260-acre farm. He built a barn away from the creek, installed the windmill to water his cattle away from it. He’s most proud of his manure management system, which moves the barn waste into a storage tank, from which he can spread it on his fields. Milk prices are only about 15 percent higher now than when he took over the family farm in 1990, while input costs — tractors, feed, energy, labor — have doubled. In July, he opened a roadside stand to sell raw milk, frozen meat, eggs, and fresh vegetables. It’s too early to tell if that will bring salvation.